The Nosh Show Episode 65 is live... though I must warn you that this is the Eric-lite version. Yes, his mighty streak of never missing an episode is broken, but have no fears, he'll be back for episode 66... which reminds me, do you guys think we should do another candy draft? I've got several ideas to keep things interesting, but it's not locked in yet and there's definitely time to get your thoughts in before it happens. Anyway, so Episode 65 is live and one of the things we talk about is pumpkin spice cookie butter. That's right, the ever growing world of cookie butter crashes in to the world of ever growing PSL. One can only imagine what next year will hold in store as both of these trends go crazy. 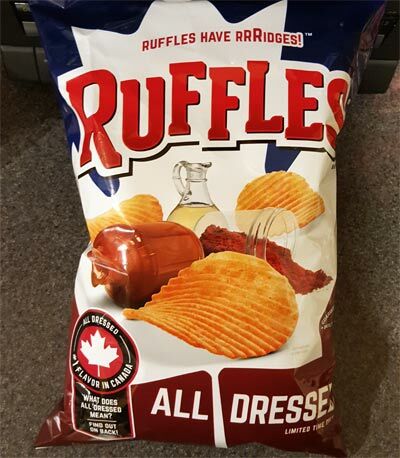 I also talk about my fondness for those Ruffles All Dressed potato chips. The bold mix of ketchup, vinegar and bbq is something I did not expect to like but was pleasantly surprised at how well they went in to the form factor of a Ruffles potato chip. We also talk about the latest from Ben & Jerry's so thanks to Bob for the heads up before the show. Alright, it's late, have a good week everyone! P.S. Have you noticed that as soon as October 1st hit, Christmas (Holiday) products started showing? Both Friendly's and Edy's (Dreyer's) are back with their peppermint offerings already. With those repeats popping up, I'm kind of curious to see how many new seasonal products will get this year, so far I only know of one.